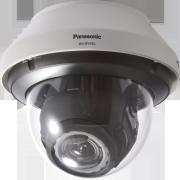 The WV-SFR310 is an Indoor Vandal Fixed Dome Network Camera that employs a newly developed 1.3 Megapixel high sensitivity MOS sensor, and can provide up to 4 H.264 High profile streams, or JPEG streams, to ensure simultaneous real time monitoring and high resolution recording from “UniPhier”; Panasonic’s proprietary System LSI platform. 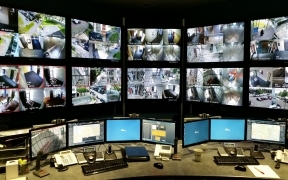 The WV-SFR310 can deliver up to 60 fps transmission at 1,280 x 720 image size. An electrical day/night function with the new developed multi process noise reduction and 3D-DNR allows clear images in low light conditions. In addition, the user has a simple way to select light control modes – just choose from outdoor, indoor or fixed electronic shutter speeds. SD edge recording is available through the WV-ASM200 and a network connection.